This is a BUNDLED version of both my Fantasy Reading Unit AND my Fantasy writing unit offered at a discounted price. Buy all your Reading and Writing lessons for a month for the cost of two cups of coffee! 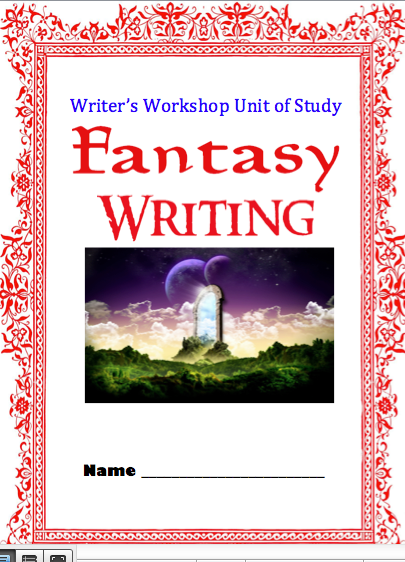 For Writer's Workshop teachers covering the fantasy genre, this writing unit is a must. It is a resource containing 14 lessons that carry students all the way through one of the most challenging genres to write. The lessons fit perfectly with both the old and updated version the Columbia Teacher's College Writer's Workshop fantasy series of mini-lessons. The lessons also encourage students to use an amazing tech integration component resource ( a setting and symbolism database blog). Writing skills specific to fantasy each build from lesson to lesson. There is another content here to cover a a five week unit on fantasy writing. Teaching writing is challenging. This unit in many ways teachers teaches about what to teach in writing! For even expert teachers of the fantasy genre, this unit contains a few twists and turns to add to their portfolio of writing instructional approaches. This unit is also a perfect compliment to my other resource: Fantasy Reading. The idea is that the teacher models these skills using the class read-aloud and then students practice the skills through book clubs, paired reading text, or independently using their independent reading books. Students can select the best 5 or 6 skills that suit their books. Pages are created for note taking and spaces for students to record their thinking. (Students can simply use the sections to categorize their stick note thinking or write directly into the booklet.) Students would be expected to work through the unit towards the creation of the final project - a presentation of their novel in a movie trailer using iMovie (or your preferred piece of technology). Guidelines for this additional activity are also provided. This is NOT a book report unit. Citing evidence is a key component of CCSS. This units forces students to cite evidence from their stories and go further by interpreting this evidence in preparation for their final class presentations. This is perfect for getting students to truly think 'deeper' about the fantasy genre. Advanced 4th grade readers could easily use this unit too. As the reading skills are generic, they are applicable across the 5th-7th grade age range as the complexity of the novels students use should create natural differentiation. This unit is a must for any study of fantasy or for a fantasy book club unit.